Now let’s get a Discord bot working on our Pi! We will need a bot token to authenticate the bot and get things going. 1. Login to the developer portal for Discord, here: https://discordapp.com/developers/applications/. 2. Once logged in, click “New Application”, and give it a name. 3. Now click “Bot” on the menu to the left. 4. Click “Add Bot”, and confirm. 5. Now you should see an option to reveal the bot’s token. We will need to get this information shortly. 6. Let’s invite the bot to a Discord server. You will need to be an administrator on the server you want to invite the bot to. To do this, go to the “General Information” option on the menu to the left, and copy the Client ID. My bot’s client ID is 554549670953615380. 7. Go to https://discordapi.com/permissions.html#3198016, and input your client ID towards the bottom. I’ve added the basic permissions that will be good for this example bot. Feel free to add more if you’d like. 8. The invite URL is the one you see towards the bottom. Go to that link in your browser. For my bot, it is: https://discordapp.com/oauth2/authorize?client_id=554549670953615380&scope=bot&permissions=3198016. 9. Confirm the server you are adding the bot to, and click “Authorize”. 10. You should now see an (offline) bot join your server. If you haven’t done the setup in that post, but are an advanced user familiar with C# / .NET Core, carry on. Otherwise, I strongly recommend going through it. 1. Open the csharpi folder in Visual Studio Code on your local machine. (note) the only reason we are creating this copy is for testing, and when we debug the app it uses this folder as its root folder. We will be creating a separate config.json on the Pi in a moment. 5. 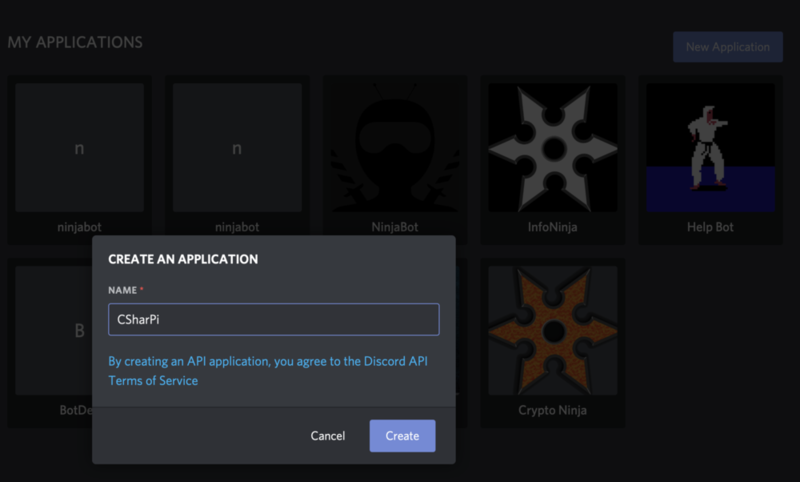 Navigate back to https://discordapp.com/developers/applications/, and click the application we made earlier. 7. Copy the token and drop it inbetween the quotes in the config.json file. (note) it is very important you keep your token a secret, and regenerate it if you think anyone else knows it. 4. Copy the contents of the file from the one created on your local machine. 6. Once the editor is opened, paste in the contents. Now it is time to add required packages to our project. We will need to add the Discord.Net package, and a couple Microsoft configuration packages to help us read and store the configuration file. 1. Open your favorite console / terminal, and navigate to the csharpi project folder on your local machine. Now we’re going to replace the contents of Program.cs with the simple bot code. This code will be the basis for future posts to come. 1. Open the csharpi folder on your local machine in Visual Studio Code. (note) If you did not name your project csharpi, be mindful of the namespace declaration and update yours to match your project name! // Block the program until it is closed. 3. Now that we have the new code for Program.cs, let’s test it by debugging (F5). Awesome! It works locally. Now let’s work on getting it to the Pi. Let’s get our new code committed to Github! 1. Open up the csharpi folder on your local machine with VS Code. 2. The Git icon should show that 2 files have been modified. These are the .csproj file with the required packages we added, and the Program.cs file we modified. 3. Since VS Code is Git-aware, let’s push these changes up to our Github repository. 4. Add a commit message and click the checkmark icon to stage/commit the files. 5. Now click the three dots “…”, and select “Push”. Now let’s get the updated code on the Raspberry Pi, and publish the app again. After we do that, we can run the updated app and ensure it works as the Discord bot! 1. SSH into your Pi. 4. Now let’s publish and run the application (since we already created config.json in /home/pi/bot earlier, it should pick up that file and have the token ready). The first command publishes the application, then we change directory to the published application, and run it. (note) The restore/publishing process will take a while, but you only need to run it if your code has changed. If all goes well, we should see our bot connected message, and we can test it out in the Discord server! 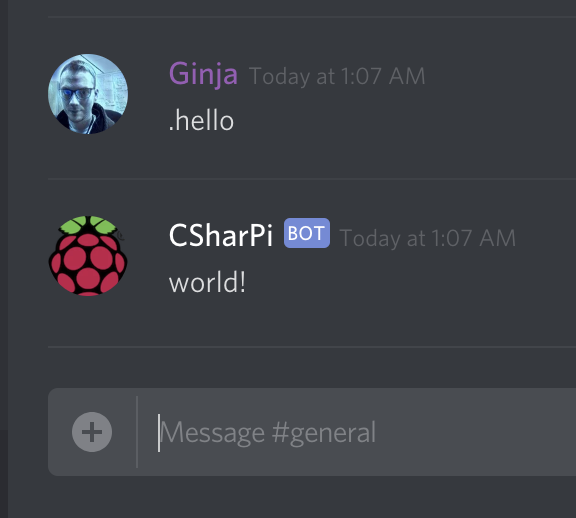 And there you have it, a Discord bot running on a Raspberry Pi, with .NET Core and C#. The next parts of this series will go over proper command handling (hint: not how we did it here), and more! If you have any feedback or questions, feel free to leave a comment below! What if I said it was possible to run a Discord bot on a Raspberry Pi natively? With .NET Core we can do just that. Let’s get some prerequisites out of the way. The first thing we’ll do is install the .NET Core SDK on our local machine, as well as our Raspberry Pi. Next, we’ll ensure Git is installed both places as well. Finally, I will be using Visual Studio Code for this project, so I will go over installing that as well. Let’s start out by installing the .NET Core SDK on our local machine. You’ll want to start here, and follow specific instructions for your OS: https://dotnet.microsoft.com/download. The one prerequisite here is that you can SSH into your Raspberry Pi. If you need some help enabling SSH, check out this article here: https://www.raspberrypi.org/documentation/remote-access/ssh/. Once you’re sshed in (Windows users that need help check this out: https://learn.adafruit.com/adafruits-raspberry-pi-lesson-6-using-ssh/ssh-under-windows), you can start installing .NET Core on your Pi. If all goes well, we should be able to run: dotnet --version. Check out this URL for help installing Git on your local machine: https://git-scm.com/book/en/v2/Getting-Started-Installing-Git. We can verify it works after installing by dropping to your favorite shell and running: git. 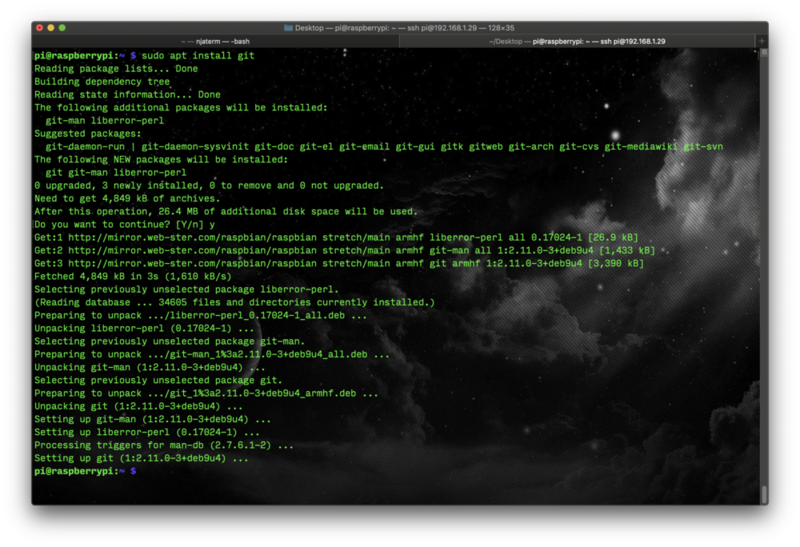 If you are using the minimal (lite) version of Raspbian, or need Git installed otherwise, run: sudo apt install git, and accept any prompts with “y”. Now we can run: git to verify it installed correctly. 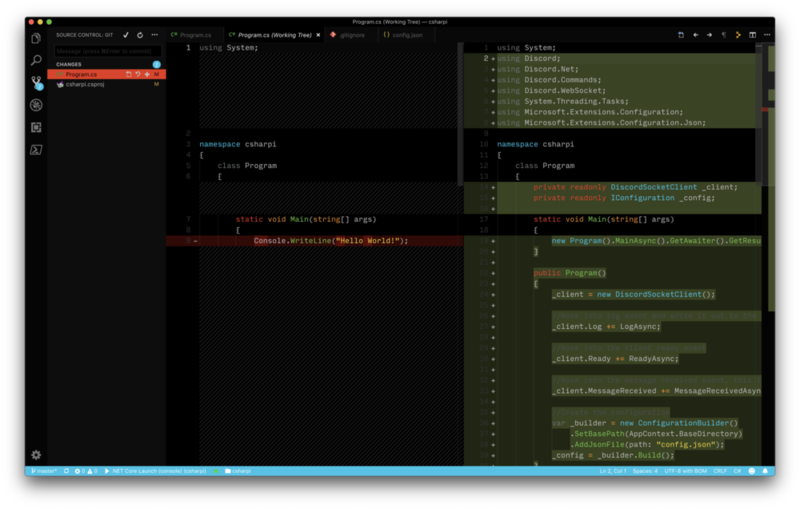 Visual Studio Code has become my editor of choice, even for some C# projects. We will install the client onto our local machine so we can edit the code there. For help installing Visual Studio Code, go here: https://code.visualstudio.com. 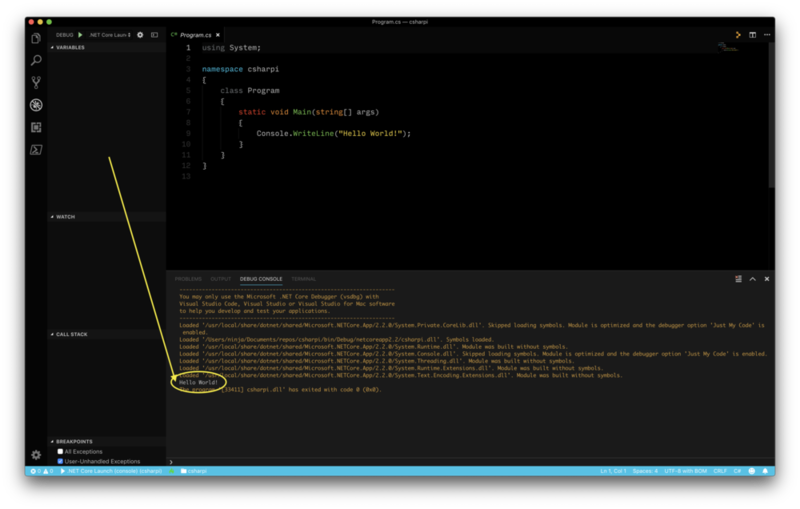 Once you have Visual Studio Code installed, open it up and click the extensions icon on the left (looks like a square). Then search for and install the C# extension. In this screenshot, it is the only one in the list for me that does not have an install option, and has a gear next to it (since I already have it installed). Once you install it, it will give you the option to reload Visual Studio Code. Now we will be creating the .NET Core project. The machine we will be doing this on is our local machine, not the Pi. Let’s start by creating a dotnet console application. 1. Fire up your favorite shell, and run: dotnet new console -n csharpi. This will create a new directory named csharpi, and create the project there. 2. Now open up the csharpi folder with Visual Studio Code. You will see a prompt in the lower right-hand corner asking if you want to add required assets, click “Yes”. If all went well, you will now see a .vscode folder in the list. 3. Now to test things out. Click Program.cs to see the example code the default project provides that will write out “Hello World” to the console. Go to the Debug menu, and click “Start Debugging” (or simply hit F5). If you see “Hello World”, our project has been created, and we have the ability to edit it in Visual Studio Code. Now we will initialize the local instance of the Git repository, and push up our code to Github. If you don’t have an account on Github, you can create one, here: https://github.com/join?source=header-home. Once you create it, log in and hang on because we will be using it shortly. 1. 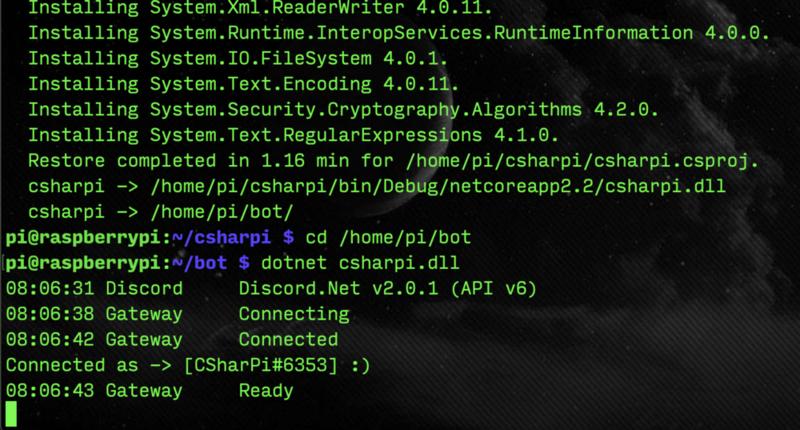 Open up your favorite terminal / console and navigate to the csharpi folder we created. Once there, run: git init. Keep the window open. 2. Open up the csharpi folder in Visual Studio Code. 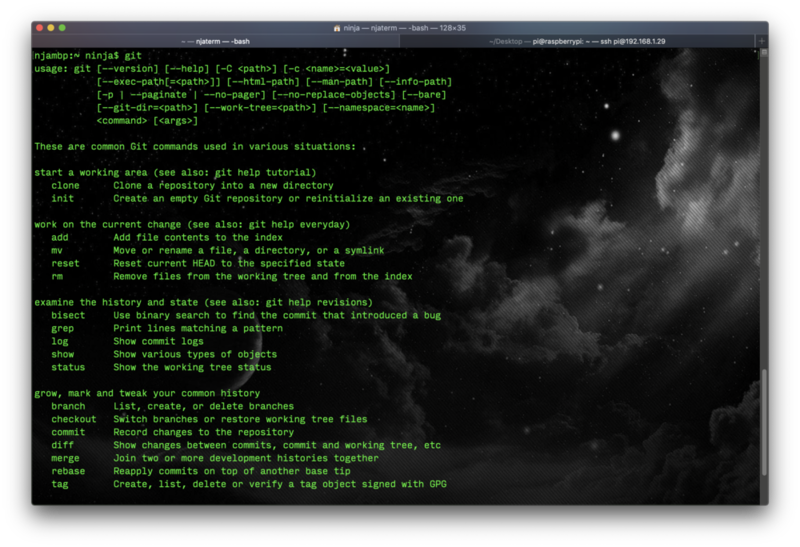 You’ll notice the Git icon (branching line) has an indicator that there are 22 files to work with. Let’s fix that by creating a file named .gitignore, and tell Git what files we don’t want to commit. This will tell Git to ignore the /bin and /obj folders, as well as any file ending in .json. Since we will be creating a json configuration file with a token we do not want to share in it later, this is a good thing. 6. Now go to Github and login. 7. Once logged in, click the [+] icon in the upper right, and select “New repository”. 8. On the next page, give it a name and description. Keep it public to follow along with this tutorial. Cloning it will be much easier on the Pi that way. 9. Click “Create repository”, and check out the instructions on the next screen. You’ll see that we completed most of it already. 10. Run the two commands for existing repository. Now let’s test that .NET Core is working correctly on the Pi. 1. Go to your Github repository for this project (for me it is https://github.com/gngrninja/csharpi), and click “Clone or download”, and then copy the URL. 5. Fret not, running the compiled/published application is much faster. To see this happen let’s create a folder under our home folder that will contain the published version of our code. 7. Now that it is published, we can run the application. It will execute much faster as the published version. Success! We now have the groundwork laid for creating the Discord bot. 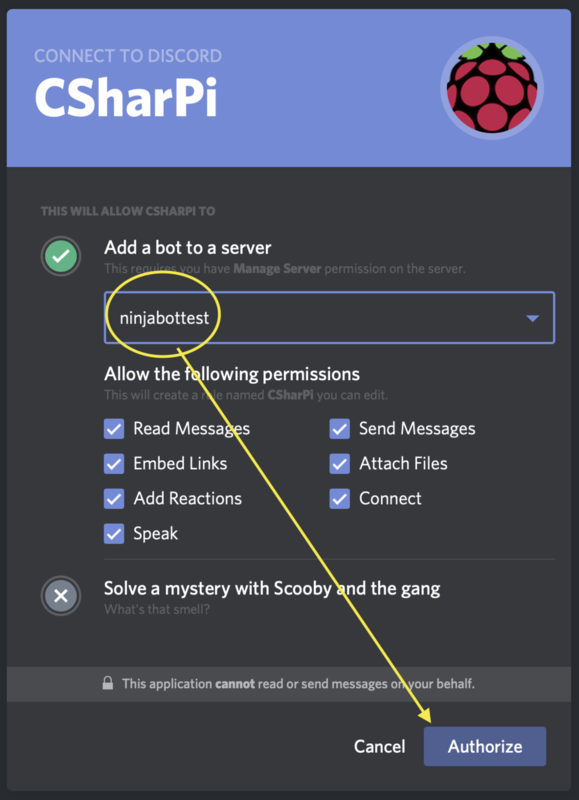 This article will get you up and running with a Discord bot on your Raspberry Pi using the Discord.Py library. This assumes that you've installed and are using Raspbian. If you’ve installed Python 3.7, you’ll need the development version of Discord.py. Check out the instructions for installing that over at their developer’s README. It is strongly recommended to stay on 3.6.x, however. If you already have a bot token, and a bot invited to your server, you can skip over to updating Raspbian. 3. Give it a name, and then click "Create App"
4. Click "Create a Bot User"
5. Keep note of the Token, as you'll need that later. The latest version of Raspbian (9.x/Stretch) ships with Python 3.5.3 (which should work great with discord.py). If you'd like to upgrade your OS to Stretch, follow this article. If you are running Stretch, great! Click here to skip to the next step. Otherwise, continue below. f. Save the file using CTRL+X, and "y"
2. Once you verified that works, try the other ones as well! Have a question or idea? Leave a comment below, or contact me here!